From the end of the eighteenth century the Burmese king Bodawpaya (r. 1782–1817), steadily expanded his realm westward. At the same time the British gained territorial control over Bengal and elsewhere in India. In 1784 Bodawpaya attacked and annexed the kingdom of Arakan on the coast of the Bay of Bengal and brought his frontier to what would become British India. Arakanese rebels operating from within British territory created a tense situation on the Anglo-Burmese border, resulting in frequent border clashes. The Burmese threatened invasion if the British failed to stop rebel incursions from their territory. From the late eighteenth century the kingdom of Assam to the North of British Bengal was in decline. The kingdom covered the Brahmaputra valley from the Himalayas to the entry of the river into the plains of Bengal. Rival groups at the Assamese court turned both to the British and the Burmese for assistance, leading to a British expedition in 1792. In 1817 turmoil at the Assamese court led to another request for assistance and this time Bodawpaya sent an invading army. The Assamese were defeated and a pro-Burmese premier was installed. Two decades earlier Bodawpaya had invaded Manipur, a kingdom set in a small valley to the west of the Chindwin River, and installed a puppet prince. 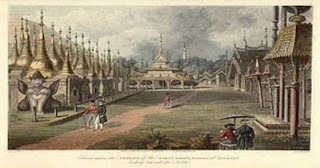 In 1819 the Manipur Prince asserted his autonomy from the Burmese court by not attending the coronation of Bagyidaw, Bodawpaya’s successor. The Burmese invaded again and stationed a permanent garrison in Manipur. Manipur would now form a base from which further Burmese military expeditions into Assam would be conducted. In 1821, following years of local unrest, Bagyidaw sent general Mahabanula with a 20,000-person-strong army across the mountains to consolidate Burmese rule in Assam. In 1823, with Assamese resistance largely broken, Mahabandula set up his base at Rangpur and began his attacks on Cachar and Jaintia. The British in turn declared Cachar and Jaintia a protectorate. British Bengal was now hemmed in on its northern and eastern borders by the Burmese Empire. In January 1824 Mahabandula assumed command in Arakan and started on a campaign against Chittagong with the ultimate goal to capture Bengal. In response, on March 5, 1824, the British declared war on Burma from their headquarters at Fort William in Calcutta. The British plan was to draw away Mahabandula’s forces from the Bengal frontier by performing a large-scale sea-borne invasion of Lower Burma. The attack on Rangoon, lead by Sir Archibald Campbell, completely surprised the Burmese and the city was taken on May 10, 1824 without any loss to the invaders. The news of the fall of Rangoon forced Mahabandula to a quick retreat. The British force in Rangoon had meanwhile been unable to proceed upcountry because it did not have adequate river transports. After having been resupplied after the monsoon Campbell continued the operations and in 1825 at the battle of Danubyu Mahabandula was killed and the same year Arakan, Lower Burma, and Tenasserim were conquered. After a second battle the way to the Burmese capital, Amarapura, lay wide open. Campbell now possessed adequate river transport and rapid progress was made up the Irrawaddy. British peace terms were so staggering that not until the British army arrived at Yandabo, a few days’ march from the Burmese capital, did the Burmese accept the terms. After the peace of Yandabo the Burmese had ceded to the British Arakan, Tenasserim, Assam, and Manipur. An indemnity in rupees, equal to 1 million pound sterling, was paid to guarantee removal of British troops from Lower Burma. BIBLIOGRAPHY Hall, D.G.E. A History of South-east Asia, 4th rev. ed. London: Macmillan, 1981. Pollak, Oliver B. Empires in Collision: Anglo-Burmese Relations in the Mid-Nineteenth Century. Westport, CT: Greenwood Press, 1979. Wilson, Horace Hayman. Narrative of the Burmese War, in 1824- 25. London: W.H. Allen and Co., 1852.